This page contains a few excerpts from my book (Working with Stories in Your Community or Organization) that describe participatory narrative inquiry in a nutshell. Participatory narrative inquiry (PNI) is an approach in which groups of people participate in gathering and working with raw stories of personal experience in order to make sense of complex situations for better decision making. PNI focuses on the profound consideration of values, beliefs, feelings, and perspectives through the recounting and interpretation of lived experience. Elements of fact, truth, evidence, opinion, argument, and proof may be used as material for sensemaking in PNI, but they are always used from a perspective and to gain perspective. This focus defines, shapes, and limits the approach. Here is the recipe for building PNI. 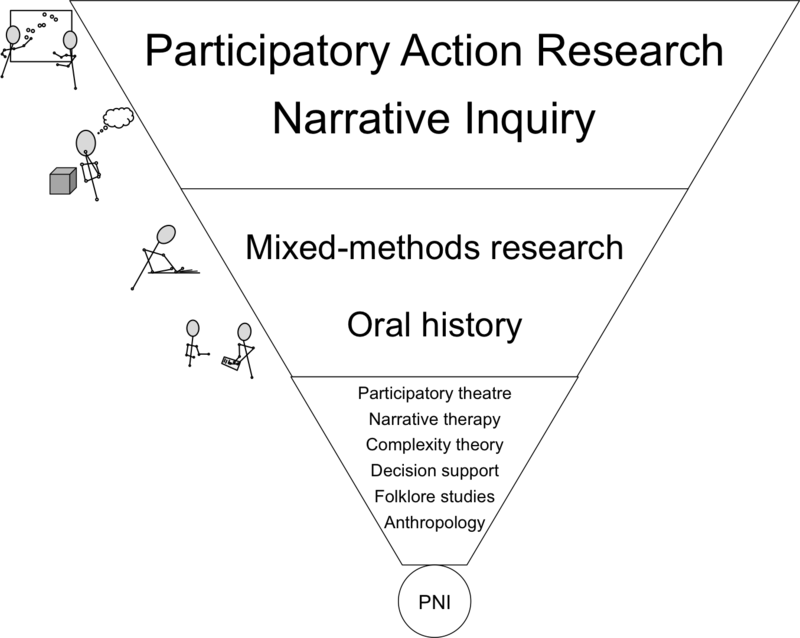 Begin by mixing together large portions of narrative inquiry and participatory action research. When this mixture stabilizes, add smaller yet substantial amounts of mixed-methods research and oral history. Add, as desired and useful, flavorings drawn from cultural anthropology, folklore studies, narrative therapy, participatory theatre, complexity theory, and decision support. Put this all together, stir well, bake, and taste. Repeat many times, and you have participatory narrative inquiry. So PNI is not so much a single idea as it is a way of putting together ideas into a package that works. The inclusion of each of the words -- participatory, narrative, inquiry -- in the name has to do with a particular emphasis of the approach, as follows. Participatory - Unlike its sibling narrative inquiry, PNI invites its participants to work with their own stories. 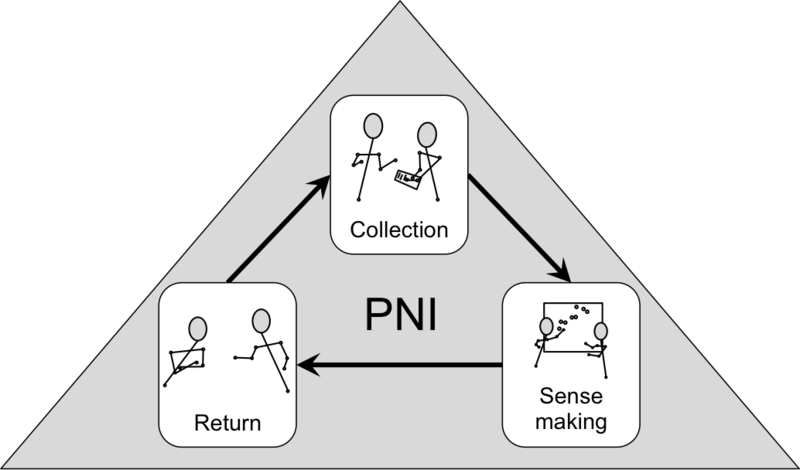 Participation in PNI can vary in degree from simply answering questions about stories to participating in structured group sensemaking activities where groups of participants ponder issues and problems. But in general, a person who facilitates a PNI project does not tell or interpret or change or even select stories. All of these things are done only by those in the group of interest. What a PNI facilitator does is help the stories get to where they need to go to help the community achieve a goal. To do this a PNI facilitator might collect stories, ask questions about them, and help people look at, think about, and talk about the stories, the answers, and the patterns they form. But a PNI facilitator never decides for the community, by themselves, what stories mean. Narrative - The most essential part of PNI is narrative. PNI is founded on the use of raw stories of personal experience. In this respect it differs from other sensemaking and decision-support approaches that sometimes incorporate narrative but do not require it. Why are stories essential to PNI? Because without them its ability to address its core goals would be reduced. In fact I've seen the approach fail (or at least perform poorly) when most of what was collected was not narrative in nature. When people tell stories, an entirely different set of social dynamics and cognitive processes takes place. When narrative is taken out of the equation, you may have sensemaking and you may have opinion gathering, but the magic of storytelling is lost. The closer you can get to natural story exchange the more powerful the magic is, but even a spoonful of narrative is worth more -- for the purposes I describe here -- than oceans of opinion. PNI is not a superior method for all decision support projects, only those for which the profound consideration of values, beliefs, feelings, and perspectives is required. There are many situations in which facts, opinions, arguments, evidence, and proof are of superior utility. For example, if you want to know which of two treatment protocols has a greater effect on the reduction of chronic inflammation, PNI will not give you the result you need. However, if you want to understand the influences of societal taboos and stigmas when supporting patients with various treatment protocols, PNI is likely to give you a more deeply meaningful result than direct questioning. Inquiry - In every PNI project somebody finds out something about something. They might better understand a conflict, or their own feelings, or the nuances of a topic, or how things got to be the way they are, or how things could improve, or any number of things. But the approach is never just about connecting or teaching or persuading people with stories. Even when a PNI project makes something happen, it happens because somebody found a new way to look at something. Including the inquiry word also makes it clear that the approach is not about telling stories (at least not all by itself). Nor is it about listening simply for the sake of listening. There is always somewhere new to get to, something to achieve. A PNI project involves three essential stages, as follows. Collection: Community members tell stories around a topic of concern and those stories are collected in some way. The nature of collection can vary widely from twenty stories gathered and used in an hour-long workshop to ten thousand stories gathered over a year and used for many years afterward. But in one way or another, all PNI projects start with stories. Whenever possible, people interpret their own stories by answering questions like "Would you say this experience is common or rare?" and "Would you tell this story to your neighbor?" (Even better, people can interpret stories told by others, so that each story becomes surrounded by a cloud of interpretations from many perspectives.) The questions used should pertain to the community and to the goals of the project. Sensemaking: Some or all community members (and sometimes interested others) participate in structured group exercises in which they negotiate meaning as they construct larger stories in the form of artifacts such as timelines, landscapes and symbol sets. Sensemaking may take place on the same day as story collection or months later; it may involve few or many people; in may take place in person or through some form of mediated contact; and it may be strongly or weakly structured and facilitated. But in some way, all PNI projects involve somebody making some use of gathered stories to better understand some situation or issue. Return: What has been gathered and produced in the first two phases is returned to the community and enters into collective discourse. Such a return may include formal reports and communications, and it may involve a wide or narrow distribution of collected stories. But it is also likely to include informal story exchanges about people's experiences surrounding the project. These informal storytellings may be more influential than the formal outputs, for better or worse, and they merit attention on their own terms. All PNI projects involve someone telling stories they would not have told before the project took place. Whether this is a stated goal of the project or not, it always happens, because the project is itself a story that takes place in the community. The return stage of the process is one project planners might be unprepared for and might prefer to sweep under the rug; but it is futile to pretend storytellers and audiences are unaffected by storytelling. In fact, conscious attention to the return stage is a mark of projects that have lasting positive impacts. The essential stages of PNI are egalitarian and multivocal in nature. They involve little top-down control, and in each the unique perspective of each participant is heard and included without coercion or artificial consensus. In the ideal PNI project all members of the community join in all essential stages, though in some projects some members may participate more in some stages than others. This is sometimes due to power differences, but not always or completely. Rarely is the entire community able, willing and motivated to participate in every stage of the process. For example, often many people will participate in the collection and return of stories, but fewer will be able or willing to invest the time required to participate in sensemaking. Trust in representation is a critical element when everyone cannot participate -- whatever the reason. 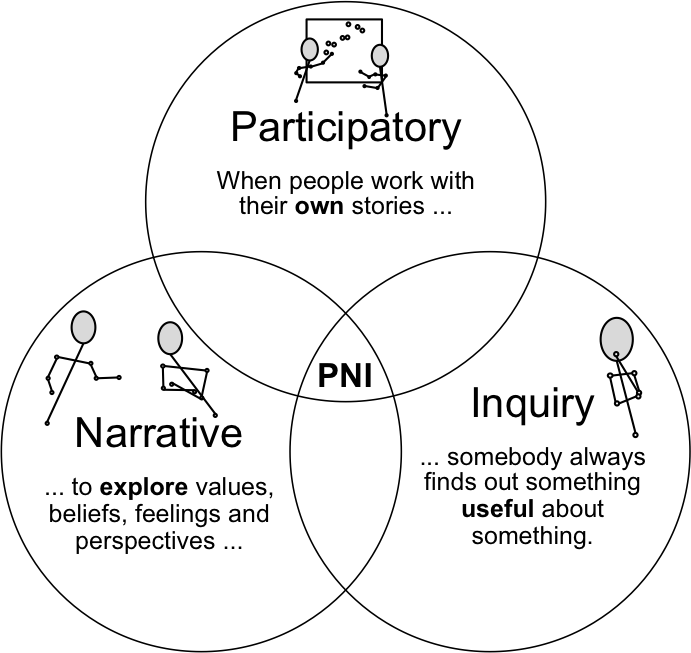 A PNI project can optionally include up to three supporting stages, as follows. Planning: Collection is sometimes preceded by a stage in which elements such as questions, workshops and exercises are chosen and/or designed. For example, a small pilot project might be used to test questions and methods before the larger project takes place. Planning serves to promote the success of the overall project, not to constrict or censor what is collected and said. Note that planning may be influenced by the return stages of previous projects. Catalysis: Sensemaking is sometimes preceded by a stage in which mixed-methods analysis is used to discover trends and patterns in collected stories and interpretations. The catalytic material produced, for example annotated images describing patterns across stories, is used as food for thought in the sensemaking process, but never as conclusive evidence or proof. I call this step catalysis (as opposed to analysis) because catalysis speeds up chemical reactions and catabolic processes break down molecules (while anabolic processes build them up). Thus catalysis serves to enhance sensemaking by asking questions, not avoid it by providing answers. To ensure that the material is catalytic rather than analytic, precautions are taken to separate statements (into observations, interpretations and implications) and provide provoking perspectives that generate questions rather than supply answers. Intervention: The return stage is sometimes preceded by an intervention stage in which action is taken based on sensemaking. Some examples of narrative interventions are story-sharing spaces, narrative orientations, narrative mentoring networks, and participatory theatre events. Intervention serves to enhance the return of stories to the community, not to control or arrest it. Ideally, interventions grounded in effective narrative sensemaking produce positive change, sparking a spiral of storytelling that leads naturally into future projects. 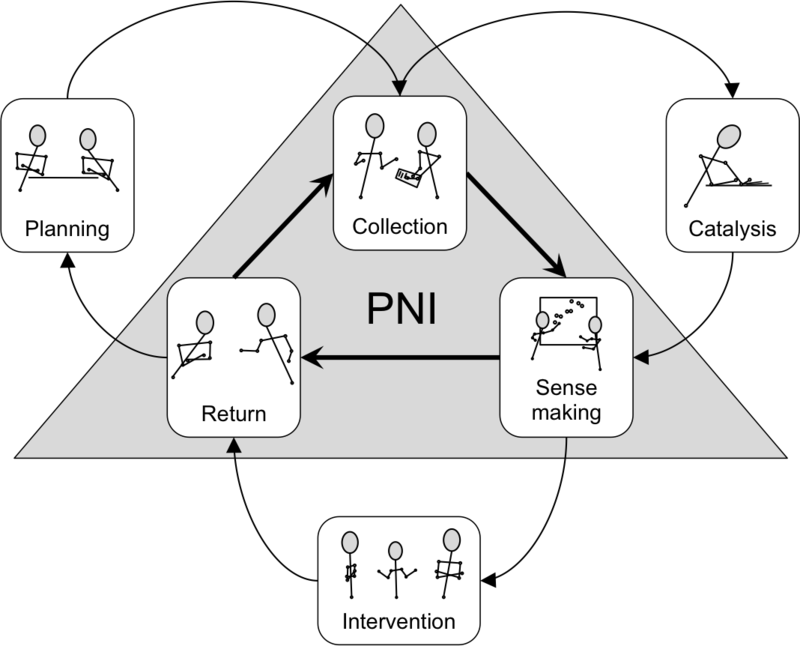 The supporting stages of PNI can be carried out by all community members, but in practice -- and much more so than in the essential stages -- they are usually carried out by limited numbers of people with the time, patience, motivation, expertise and/or authority to do the concentrated and sometimes difficult work required. However, the supporting stages are not levers that control the project, as anyone who seizes them for that purpose will soon find out. Since the essential phases are participatory and egalitarian in nature, any attempt to constrict or control them through the supporting phases will cause the entire project to fail. Outsiders in particular cannot participate in or control the essential triangle of PNI (without causing some damage) but must maintain a purely supportive role in those areas. How participatory is participatory enough? I chose the name of PNI in part to separate the approach from traditional narrative inquiry, in which stories are collected, examined, interpreted, summarized, and retold by experts -- with "informants" doing nothing but having their stories surgically extracted. I do not consider this to be participatory (nor would many adherents of participatory action research, of which PNI is a subset). But I don't know if it is productive to draw lines of distinction between what is participatory enough and what isn't. Purists sometimes destroy what they hope to protect. I'd rather say "more participation is better" and leave it at that. In my experience, the greater the degree of participation the stronger the positive impact of any project that involves people and aims to improve some situation faced by those people. I have also noticed that some forms of participation are easier to manage than others. So I generally encourage people planning projects to think about taking one more step up the staircase of participation, wherever they find themselves now; but I order the steps so as to make the transition more feasible in practice. If you are asking people to tell you stories, why not ask them what their stories mean? If you already do that, why not ask people what the stories other people told mean? If you already do that, why not ask people to build something with their stories? Why not ask them what that means? If you already do that, why not ask people if they can see any trends in the stories that have been told? If you already do that, why not ask people to design interventions based on the stories they have told and heard? Then, why not ask people to help you plan new projects? And so on. As you step up, keep watching your project to see if increasing participation is making it better. If it stops making the project better (for the people you are doing the project to help), stop increasing the participation. Wherever you find yourself is participatory enough. For now. Contextual richness. When you ask direct questions, it is easy to guess wrongly about what sorts of answers people might have and even about what sorts of questions might lead to useful answers. This is often a problem when exploring complex topics. Asking people to talk about their experiences can sometimes lead to useful answers even if the wrong questions were asked, because the contextual richness of stories provides information in excess of what was directly sought. In fact, being surprised by the questions posed (and answered) by collected stories is a standard outcome of narrative inquiry. You can read much more about PNI and working with stories in my book Working with Stories in Your Community or Organization, available in print or Kindle forms on Amazon.com or in PDF format (for free or for a donation, you choose) at workingwithstories.org.